The median age for diagnosis of endometrial carcinoma is about 60 years. Abnormal bleeding is the most common presenting symptom, but a few patients are asymptomatic.10,14 Because there is no adequate screening test for endometrial cancer, it is common practice to sample the endometrium of postmenopausal women who experience abnormal bleeding. The Pap smear, although adequate for screening for cervical intraepithelial neoplasia and carcinoma, has an unacceptably high false-negative rate for detecting endometrial cancer. Endometrial carcinomas with associated hyperplasia tend to be well differentiated and have lesser degrees of myometrial invasion than lesions without such an association.15,16,17 Exogenous estrogen users have better-differentiated tumors than women who do not use estrogen. More aggressive variants of endometrial carcinoma, such as serous and clear cell carcinoma, are usually not associated with or preceded by hyperplasia. Endometrial carcinoma most frequently arises in the corpus proper, but it may also originate in the lower uterine segment. There are no distinctive gross appearances to differentiate individual subtypes (cell type). In low-volume disease, it is common to find no evidence of residual disease after diagnostic endometrial curettage.23 Localized disease manifests as round, polypoid expansile masses that are friable and often hemorrhagic. Diffuse involvement of the endometrium may show an indurated-appearing surface without a visible exophytic component. Necrosis and hemorrhage may be seen. Foci of myometrial invasion generally appear grossly as well-demarcated gray-white areas that are lighter in color than the surrounding uninvolved myometrium. Extension from the surface lesion is commonly demonstrated. Intraoperative pathology consultation may be obtained to determine the depth of gross myometrial invasion or cervical extension. With the revised International Federation of Gynecology and Obstetrics (FIGO) staging system,22 this important information may affect the remaining course of the surgical procedure. Ideally, the pathologist should measure both the width of the myometrium and the depth of the tumor invasion. Fig. 1. A well-differentiated endometrioid adenocarcinoma obtained from a curettage specimen. Note the absence of intervening stroma between the irregularly shaped glands. Nuclei demonstrate only mild pleomorphism. Fig. 2. Contrast the marked nuclear pleomorphism and solid growth pattern of this grade 3 endometrioid adenocarcinoma with the well-differentiated carcinoma in Fig. 1. Fig. 3. The altered stroma adjacent to the invasive foci of this high-grade endometrioid carcinoma is characteristic of a desmoplastic stromal response. The pale staining is due to edema and myxoid change, which is often accompanied by an inflammatory cell infiltrate. Fig. 4. Although the endometrial glands within this focus of complex hyperplasia are irregular and complex in configuration, intervening stroma is present between the glands. This feature is important in distinguishing complex hyperplasia from a well-differentiated adenocarcinoma. The first pattern is the most common. To be clinically significant, the less common patterns must be present in a focus greater than half of a low-power field (2.1 mm in diameter). Unfortunately, this requirement is difficult to fulfill, because the fragmented material obtained in an endometrial biopsy often fills less than half of a low-power field.30 Many grade 1 adenocarcinomas of the endometrium have little or no cytologic atypia; however, atypical hyperplasia may have severe nuclear aberrancy, thus rendering individual nuclear characteristics noncontributory in the distinction between hyperplasia and carcinoma. In 1988, ISGYP and FIGO approved a revised grading scheme in response to preliminary findings of the Gynecology Oncology Group's (GOG) Protocol 33. Previous classifications lacked clear guidelines and resulted in poor reproducibility. This newer method of grading is predominantly based on architecture (Table 2). Adenocarcinomas having 5% or less nonsquamous or nonmorular solid growth are designated as grade 1, those with 6% to 50% solid growth as grade 2, and those with more than 50% solid growth as grade 3.
Notable nuclear atypia, inappropriate for the architectural grade, raises the grade of a grade 1 or 2 tumor by one grade. In serous, clear cell and squamous cell carcinoma, nuclear grade takes precedence. In adenocarcinoma with squamous differentiation, the nuclear grade of the glandular component determines the histologic grade. Unlike the 1971 FIGO grading, the revised system recognizes that occasional lesions have more nuclear atypia than is appropriate for the architectural grade. Significant nuclear atypia is defined as hyperchromasia, pleomorphism, irregular chromatin clumping, parachromatin clearing imparting a vesicular appearance, and loss of cellular polarity. If the nuclear grade is incongruent with the architectural grade, then the grade is increased by one (for grade 1 and 2 lesions). Nuclear grading takes precedence over architectural grading in serous, clear cell, squamous, and undifferentiated carcinomas, which are considered grade 3 lesions. Variants of endometrioid adenocarcinoma include villoglandular, secretory, ciliated cell, and adenocarcinoma with squamous differentiation. Overall, the epidemiologic characteristics of the subtypes are similar to those of typical endometrioid carcinoma; the few exceptions are mentioned with each section. Because it is not unusual to observe these patterns in association with the usual form of endometrioid cell type, most of the lesion must consist of the histologic features of the subtype for it to be considered a distinct entity. 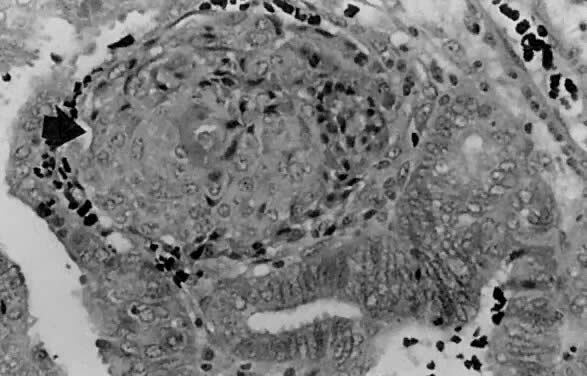 Villoglandular carcinoma is characterized by a papillary architecture with delicate fibrovascular stalks lined by cuboidal to columnar cells with minimal cellular stratification and mild nuclear pleomorphism (Fig. 5). Nucleoli are indistinct. It is important to distinguish this well-differentiated papillary variant of endometrial carcinoma from serous carcinoma, which is often papillary but displays grade 3 nuclear atypia with vesicular nuclei, prominent nucleoli, and necrosis.21,29 Serous carcinoma often forms papillary tufts, small clusters of cells that are detached from the papillary fronds. Psammoma bodies may be observed in either tumor type27 and are therefore not reliable distinguishing features. Villoglandular carcinoma only superficially invades the myometrium, being diagnosed at an early stage and thereby having a better prognosis than typical endometrioid carcinoma. To avoid confusion with papillary serous carcinoma, some authors refer to this entity as endometrioid adenocarcinoma with papillary architecture. Fig. 5. ( A) Long papillary stalks lined by endometrioid-type cells are characteristic of the villoglandular or papillary variant of endometrial adenocarcinoma. 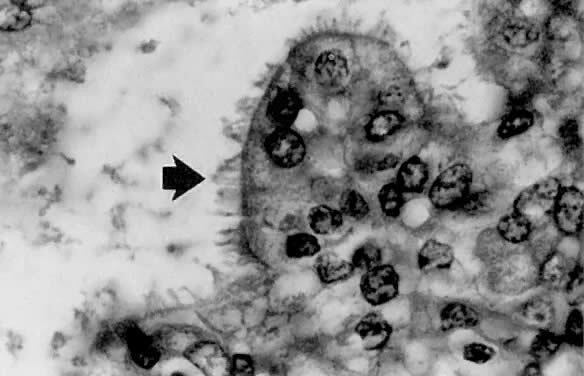 ( B) The papillae are lined by stratified cells demonstrating mild nuclear atypia. Cellular budding and high-grade nuclear features are absent, aiding in distinguishing this lesion from serous carcinoma. 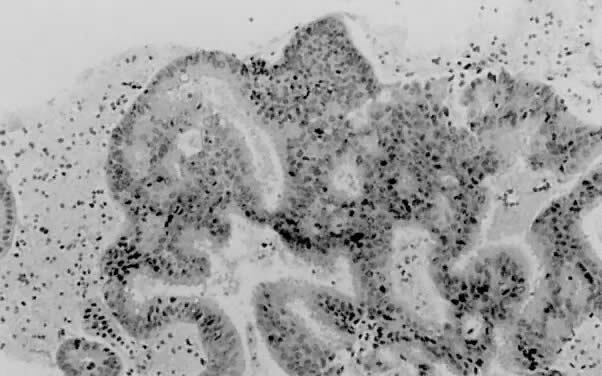 Less than 1% of endometrial adenocarcinomas are classified as secretory carcinomas.20 The well-differentiated glands of this variant appear histologically similar to secretory phase endometrium (postovulatory days 3 to 6), with abundantly vacuolated columnar cytoplasm, either subnuclear or supranuclear20,30,31,32,33,34,35 (Fig. 6). Cellular atypia is minimal. Squamous and tubal metaplasia frequently accompany this cell type.20 The adjacent nonmalignant endometrium typically shows changes consistent with prolonged or unopposed estrogen effect (e.g., hyperplasia, stromal breakdown, and thrombosis of vessels). The excellent prognosis seen in these patients is due to the fact that most have surgical stage I disease, and invariably the neoplasm is of low grade both architecturally and cytologically. Distinction from clear cell carcinoma is important due to the marked differences in prognosis. Although both types have intracytoplasmic glycogen, secretory carcinoma does not demonstrate papillary or cystic architecture, nor does it show grade 3 nuclear atypia or the hobnail pattern commonly seen in clear cell carcinoma. Separation of secretory carcinoma from secretory changes in atypical hyperplasia is based on the presence of stromal invasion and back-to-back glands found in carcinoma. Fig. 6. ( A) Secretory carcinoma is characterized by prominent cytoplasmic vacuoles and intraluminal secretions. ( B) The arrow denotes the uniform subnuclear vacuoles. 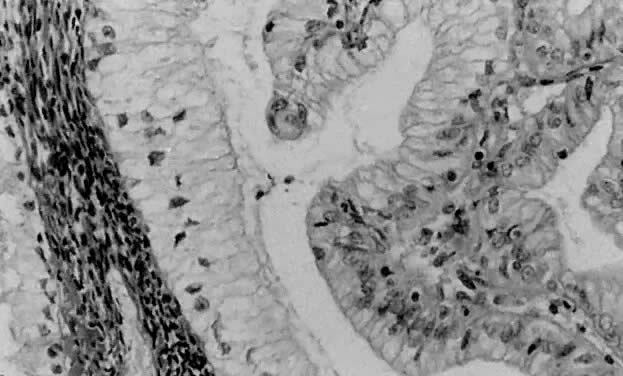 The ciliated cell variant of endometrial carcinoma is exceedingly rare, with only a few reported cases in the literature. 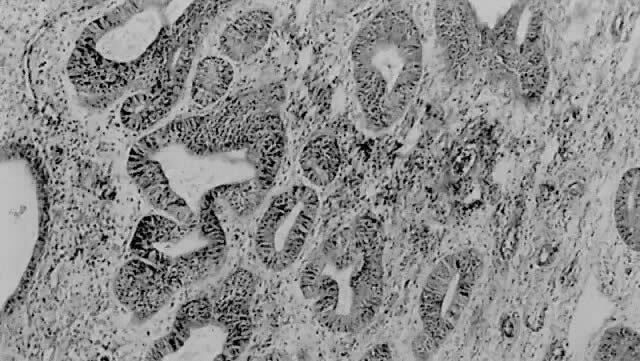 Although most endometrial lesions with ciliated cells represent metaplasia, it is important to be cognizant of this subtype, which meets the architectural criteria for carcinoma, usually in the form of cribriforming. Ciliated cell carcinoma is well differentiated and consists of glands lined predominately by ciliated cells with abundant eosinophilic cytoplasm (Fig. 7). There is usually minimal nuclear atypia, with mildly irregular nuclear contours and prominent nucleoli. Association with exogenous estrogen use is typical,36 correlating with the observation that normal endometrium forms cilia with estrogen stimulation. Thus far, no reports of recurrence or death due to disease have been described. Fig. 7. Ciliated cell carcinoma. Most of the neoplastic glands are lined by ciliated cells ( arrow) showing mild to moderate nuclear atypia. Squamous differentiation in endometrial carcinoma (Fig. 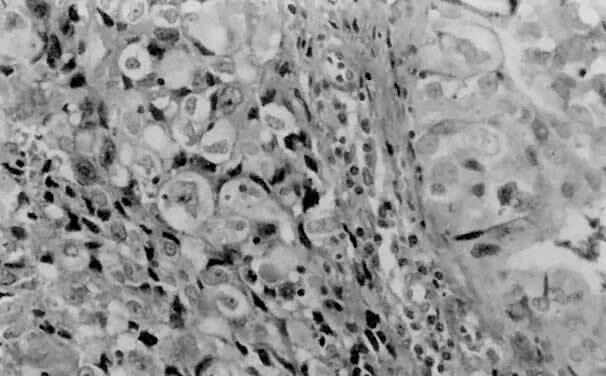 8) is a frequent finding, noted in about 25% of cases.37,38,39,40,41 To be classified as such, 5% or greater of the carcinoma must exhibit one or more of the following patterns: keratin pearl formation, defined intercellular bridges, or morules consisting of ovoid or spindled (glassy) cells.8,37 Although the occurrence of squamous differentiation in endometrial carcinoma is well accepted, its significance has proven to be quite controversial. Until recently, most have divided endometrial carcinomas with squamous differentiation into two categories. Adenoacanthoma38,39,40 was a term previously used to describe lesions that had a benign squamous component accompanying the invasive adenocarcinoma. Adenosquamous carcinoma was reserved for adenocarcinomas that also had obvious malignant squamous features. Silverberg38 defined criteria for distinguishing between adenoacanthoma and adenocarcinoma, proposing that the presence of malignant squamous elements imparts a worse prognosis. However, the current terminology used by the GOG is adenocarcinoma with squamous differentiation, making no distinction as to the degree of differentiation of the squamous component. Fig. 8. Squamous differentiation in endometrial adenocarcinoma is frequent. 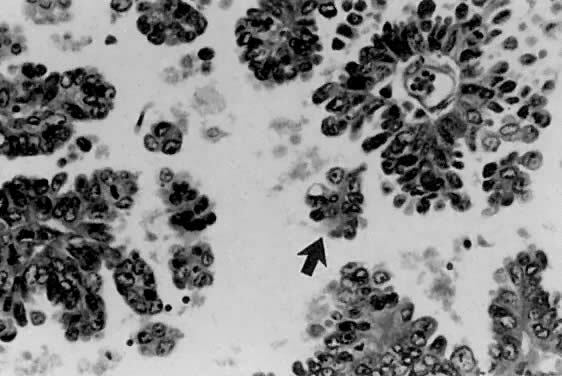 This is an example of a squamous morule ( arrow ), which is a collection of polygonal cells with abundant eosinophilic cytoplasm forming a nodular structure between neoplastic endometrial glands. Mucinous carcinoma is typically of low grade and is the least common type of endometrial adenocarcinoma. Intracytoplasmic mucin must be present for a neoplasm to be placed in this category.8 Although polypoid lesions are more commonly identified in this type of carcinoma,42 other macroscopic features are similar to typical endometrial carcinoma. Histologically, the neoplastic glands, often forming papillary structures, are lined by mucin-secreting columnar cells resembling either endocervical (Fig. 9) or gastrointestinal epithelium. Often present are cystically dilated glands with abundant intraluminal mucin. 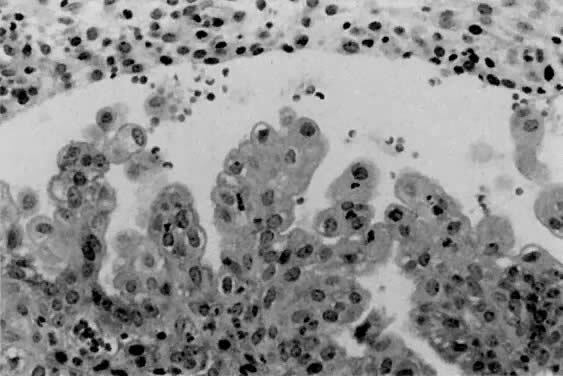 The nuclei generally demonstrate only mild atypia, and mitoses are uncommon. Fig. 9. Mucinous carcinoma is generally well differentiated and is characterized by columnar cells with basally located nuclei and mucin-rich cytoplasm. On rare occasions, one encounters an endometrial lesion that appears histologically similar to microglandular hyperplasia of the cervix.43,44 This distinctive pattern consists of small glands (microcysts) lined by flattened cuboidal cells with mild nuclear atypia. Groups of polygonal cells with eosinophilic cytoplasm are present between the glands. Abundant amounts of inflammation in the form of neutrophils are present within the luminal spaces and among the epithelial cells. When this pattern is observed, it is important to exclude microglandular hyperplasia of the cervix, especially if the diagnosis is made on a curettage specimen. Aggressive types of endometrial carcinoma recognized by ISGYP account for less than 20% of overall cases but constitute a high proportion of nonsurvivors at 5 years.1,20,21,41 The variants include serous, clear cell, squamous, and undifferentiated carcinoma. Serous carcinoma is a relatively uncommon type of endometrial carcinoma, accounting for about 5% to 10% of cases. This is an especially aggressive variant, with patients often presenting with stage II or III disease, deep myometrial invasion (40% to 50%), and frequent vascular invasion.21 The mean patient age is 70 years,45 somewhat older than for patients with endometrioid carcinoma. It occurs disproportionately in African-American women. Whereas about 53% of patients with endometrioid carcinoma have a history of exogenous estrogen use, only 21% of patients with serous carcinoma have such an association.21 Nulliparity is not a common epidemiologic factor in serous carcinoma. These tumors have a predilection for peritoneal spread, similar to primary ovarian serous adenocarcinoma.24 A papillary configuration is frequently present histologically (Fig. 10), but these lesions may grow in a solid or acinar pattern. For this reason, this variant should be referred to as serous carcinoma rather than papillary serous carcinoma. 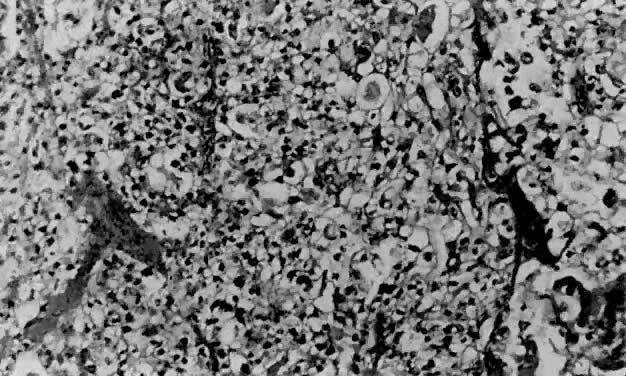 Papillae, when present, have fibrovascular cores that are lined by pleomorphic, hyperchromatic nuclei with eosinophilic macronucleoli (nuclear grade 3). Not infrequently, large, bizarre nuclei, often multinucleated, are observed. Cellular stratification and tufting or budding are frequently found (Fig. 11). The surface of the papillae are irregular and jagged, unlike the smooth surface of the villoglandular variant of endometrioid carcinoma. The solid or acinar patterns show cellular features as described above. Psammoma bodies (Fig. 12) are seen in about a third of cases. Due to the usually high nuclear grade, advanced stage of disease, deep myometrial invasion, and vascular space invasion, patients tend to have a poor prognosis, with a 25% to 35% 5-year survival rate45,46,47 and a 14% 10-year survival rate.47 Lung and liver are the most common sites of metastasis48 in advanced-stage serous carcinoma of the endometrium. Fig. 10. Complex arborization of papillary structures is seen in serous carcinoma. Cellular budding and tufting can often be appreciated under low power. Fig. 11. Serous carcinoma. The papillae have fibrovascular cores and are lined by vesicular nuclei with prominent eosinophilic nucleoli. Small clusters of cells that have separated from the papillae are referred to as cellular budding ( arrow ). Fig. 12. Although more commonly seen in serous carcinoma, psammoma bodies ( arrow) may also be found in the villoglandular variant of endometrial carcinoma. Clear cell carcinoma accounts for about 1% to 5% of endometrial carcinomas in most reports. It is associated with a poor prognosis (5-year survival rate of about 35%)20,46 and occurs almost exclusively in postmenopausal women. Although there are no distinctive macroscopic features, there are four histologic growth patterns that may aid in the diagnosis. These patterns are, in decreasing frequency, papillary (Fig. 13), tubulocystic, glandular, and solid (Fig. 14). Clear cell, hobnail, and cuboidal are the three cell types one may encounter. Most neoplasms display two or more patterns, as well as a mixture of cell types. Because of abundant glycogen accumulation, the cytoplasm of the neoplastic cells usually appears clear histologically, although it may be eosinophilic. The nuclear changes are also distinct, with irregular nuclear outlines and chromatin clumping, especially along the nuclear envelope.49 Nucleoli often are large and may be multiple. The nuclei of hobnail cells protrude into cystic spaces in the papillary variant (see Fig. 13). FIGO grading is restricted to nuclear grade in clear cell carcinoma (which is almost exclusively grade 3).22 In addition to the high nuclear grade, these patients tend to present with high-stage disease, thus contributing to their poor prognosis. Fig. 13. 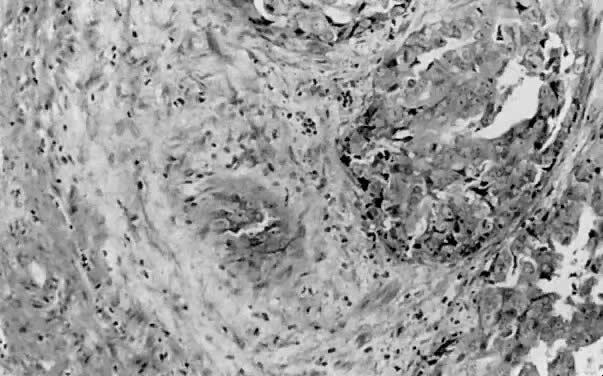 ( A) This example of the papillary pattern of clear cell carcinoma demonstrates complex papillae with fibrovascular cores lined by one to multiple layers of clear cells. ( B) Hobnail cells protrude into a cystic space ( arrow ). 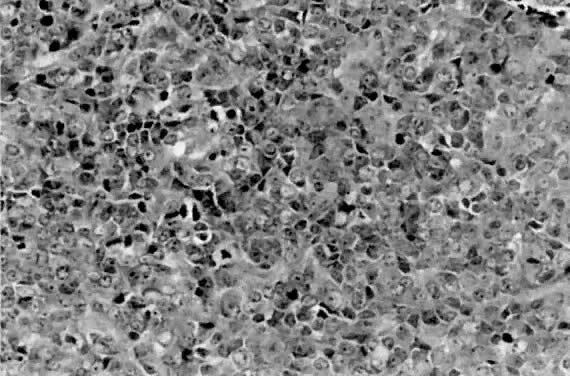 Other cells display the typical clear cell morphology with irregular, primitive-appearing nuclei and abundant clear cytoplasm that is rich in glycogen. Fig. 14. 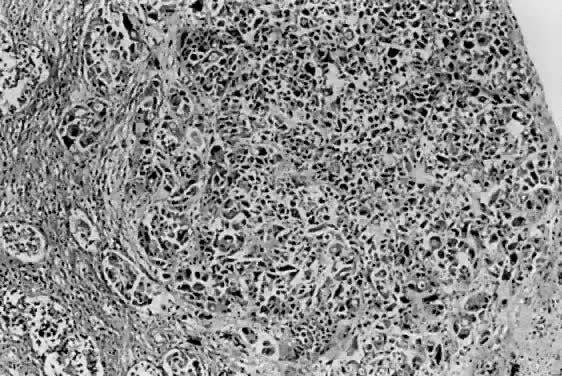 Clear cell carcinoma may exhibit a solid pattern consisting of sheets of clear cells separated focally by thin fibrous bands. About 30 cases of primary squamous cell carcinoma (SCC) of the endometrium have been described.50,51,52 Tumors classified as pure SCC must fail to show involvement of the cervix. By convention, SCC involving both the cervix and the endometrium is considered a cervical primary. An additional requirement for categorization of pure SCC of the endometrium is an absence of adenocarcinoma of the endometrium. If present, the squamous component is then considered extensive squamous differentiation within an endometrial carcinoma. Varying degrees of differentiation of the SCC can be seen. Identifying features of SCC include intercellular bridges and keratinization (Fig. 15). Primary SCC of the endometrium is associated with a grim prognosis,50 with deep myometrial invasion and extrauterine extension common. Five-year survival is about 36%. Fig. 15. 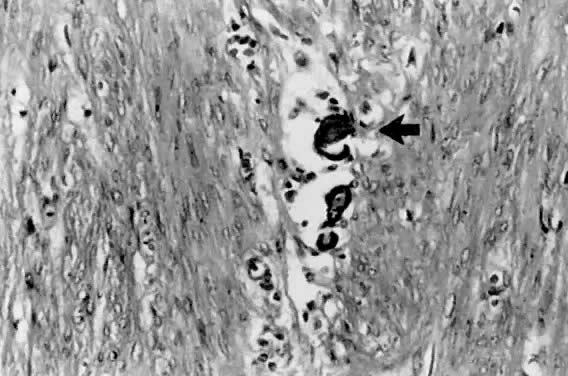 ( A) As with squamous cell carcinoma in other locations, the presence of keratin pearls ( arrow) or intercellular bridges is diagnostic. ( B) The neoplastic cells have voluminous eosinophilic cytoplasm and marked nuclear atypia. Verrucous carcinoma of the endometrium has also been described.51,53 Criteria for classification are similar to those of pure SCC. These lesions are exophytic and microscopically consist of papillary projections lacking fibrovascular cores. The deep margin has a pushing broad-based front. Superficial myometrial invasion may be observed. Similar to verrucous carcinomas in other locations, it usually has a good prognosis. Tumors lacking definitive glandular or squamous differentiation are termed undifferentiated carcinomas. 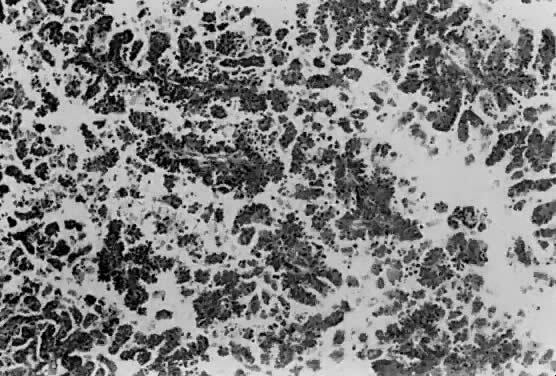 This group is often divided into large and small cell categories.54 Small cell carcinomas range histologically from diffuse sheets of poorly differentiated cells (Fig. 16), similar to small cell carcinomas of other locations, to patterns simulating carcinoid tumors.55 Reactivity with neuroendocrine antibodies is not uncommon in the small cell group.54,56 Also described in the literature are undifferentiated carcinomas with multinucleated giant cells,57 occasionally resembling osteoclast-like giant cells. The prognosis is comparable to a grade 3 endometrial carcinoma, regardless of small or large cell morphology. Fig. 16. Small cell carcinoma is characterized by sheets of round to oval cells with granular chromatin and often dot-like nucleoli. The mitotic rate is quite high in these clinically aggressive lesions. Mixed carcinomas of the endometrium, by definition, contain more than one cell type. The second cell type must account for at least 10% of the tumor volume. The prognosis is most likely related to the highest-grade component; however, long-term studies have not been performed to confirm the behavior of these lesions. Numerous types of metaplasias, defined as replacement of endometrial glandular epithelium by epithelium not normally found in the endometrium, are recognized. These include tubal (Fig. 17), squamous, mucinous, ciliated cell, eosinophilic, surface syncytial, papillary (Fig. 18), and clear cell.58,59 Metaplasias often occur in women receiving exogenous estrogens.58,60 The importance of recognizing metaplasias lies not only in differentiating this group of benign epithelial changes from carcinoma but also in appreciating that they often accompany carcinoma58,60 and hyperplasia. Fig. 17. Tubal metaplasia is probably the most frequently encountered metaplasia of the endometrium. 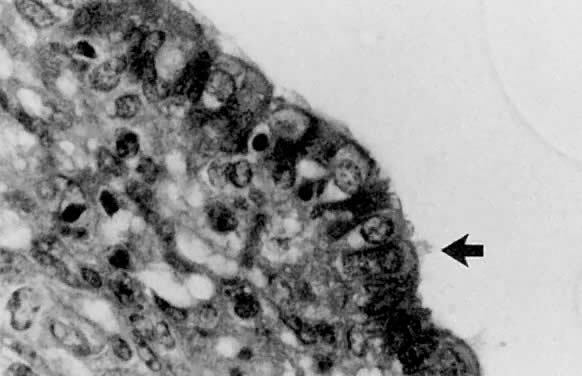 Ciliated cells ( arrow) interdigitate with peg cells, which have perinuclear clearing. Fig. 18. Papillary metaplasia may mimic an adenocarcinoma with papillary features at low magnification; however, the bland, uniform lining cells favor a benign process. Also, the papillae in papillary metaplasia are limited to the surface epithelium. Depth of myometrial invasion has proven to be an independent predictor of outcome in early-stage endometrial carcinoma.61,62,63,64,65 Increasing depth of myometrial invasion is associated with a greater probability of nodal metastasis and death from tumor,2,3,37,38,64,66 even when adjusted for histologic grade and subtype. It is common practice in the United States to report depth of myometrial invasion by thirds (inner third, middle third, and outer third of myometrial thickness), even though FIGO divides depth of invasion into halves. Ideally, the total width of the myometrium should be measured and reported in addition to the measurement of the thickness of tumor invasion. With these two measurements, the clinician can proceed with the division of his or her choice. Determining the depth of myometrial invasion by endometrial carcinoma may be complicated when foci of adenomyosis are involved. Adenocarcinoma present in adenomyosis does not represent true myometrial invasion and does not correlate with a worse prognosis.61 Recognizing well-demarcated rounded areas deep within the myometrium with associated benign endometrial glands or stroma and without extension to the neoplasm involving the surface is important in separating adenomyosis from invasive carcinoma. Adenocarcinoma arising within a focus of adenomyosis without synchronous surface involvement is rare.62,63 Not infrequently, adenocarcinomas arise in hyperplastic endometrial polyps. If limited to the polyp without stalk invasion, the prognosis is excellent. Not uncommonly, one encounters simultaneously occurring endometrial and ovarian tumors, usually of endometrioid cell type. Although it may be diagnostically challenging to discern if these represent an endometrial carcinoma metastatic to the ovary, an ovarian carcinoma metastatic to the endometrium, or true synchronous tumors, there are significant implications in regard to therapy and prognosis. Synchronous lesions are favored when the endometrial carcinoma is minimally invasive and small.73 An endometrial primary with metastasis to the ovary is most likely when the ovarian tumors are multiple and less than 5 cm in greatest dimension, and when deep myometrial invasion and vascular invasion are present. Although metastasis to the ovary from an endometrial primary occurs with some frequency, ovarian neoplasms only rarely metastasize to the endometrium.74 A recent investigation of loss of heterozygosity, examined through the polymerase chain reaction technique, suggested that a higher rate of loss of heterozygosity was detected in patients with synchronous lesions than in patients with single tumors.75,76,77,78 Obviously, additional studies are necessary to confirm this information, but the findings are intriguing and an example of how molecular diagnostics may provide useful information. Metastatic lesions involving the endometrium are uncommon. Direct extension from cervical or fallopian tube primaries account for the majority. Extragenital primaries are exceedingly infrequent75,77 and occur only in disseminated disease.76 The most common primary sites are breast (Fig. 19), stomach, melanoma, and colon. Fig. 19. This nodular atypical infiltrate represents metastatic breast cancer. Poorly formed ductal structures can be identified. A battery of immunohistochemical stains would aid in differentiating this lesion from primary endometrial carcinoma. Expression of estrogen receptors (ER) and progesterone receptors (PR) is found in most endometrial carcinomas, but in amounts lower than can be identified in normal cycling endometrium.80,81,82,83,84,85 Although neither ER nor PR expression correlates with stage, myometrial invasion, or lymph node metastasis, many recent reports suggest that expression of PR correlates with low tumor grade, low recurrence rate, and higher survival.84,86,87 Conversely, the absence of PR is associated with a worse prognosis.80 In patients with disease clinically confined to the uterus, the 5-year survival is 86% with ER-positive and PR-positive tumors and only 52% in ER-positive and PR-negative tumors.83,84 Therefore, PR status may be relevant in predicting prognosis as well as consideration of therapy with progestational agents in PR-positive tumors. High-grade tumors such as serous and clear cell carcinoma tend to be negative, with antibodies directed toward ER and PR.80,81,82 Although a number of studies have provided encouraging data, additional long-term studies are required to establish definitive predictive and therapeutic value.